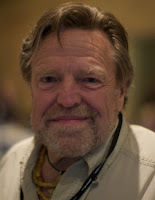 Vicky Reich and I were both acquainted with John Perry Barlow in the 90s; we met at one of the parties he threw at the DNA Lounge. He was perhaps the most charismatic person I've ever encountered. So we were anxious to attend the symposium the EFF and the Internet Archive organized last Saturday to honor one aspect of his life, his writing and activism around civil liberties in cyberspace. The Economist, The Guardian and the New York Times had good obituaries, but they mentioned only his Declaration of the Independence of Cyberspace among his writings. It was undoubtedly an important rallying-cry at the time, but it should not be allowed to overshadow his other cyberspace-related writings, thankfully collected by the EFF in the John Perry Barlow Library. Below the fold, the one I would have chosen. Throughout the time I've been groping around cyberspace, an immense, unsolved conundrum has remained at the root of nearly every legal, ethical, governmental, and social vexation to be found in the Virtual World. I refer to the problem of digitized property. The enigma is this: If our property can be infinitely reproduced and instantaneously distributed all over the planet without cost, without our knowledge, without its even leaving our possession, how can we protect it? How are we going to get paid for the work we do with our minds? And, if we can't get paid, what will assure the continued creation and distribution of such work? when the primary articles of commerce in a society look so much like speech as to be indistinguishable from it, and when the traditional methods of protecting their ownership have become ineffectual, attempting to fix the problem with broader and more vigorous enforcement will inevitably threaten freedom of speech. The greatest constraint on your future liberties may come not from government but from corporate legal departments laboring to protect by force what can no longer be protected by practical efficiency or general social consent. Read the whole thing, it is truly prophetic. He will be sorely missed. If you appreciate his work, please donate to the Electronic Frontier Foundation or (preferably and) to the Freedom of the Press Foundation, both of which he co-founded. And buy his forth-coming memoir, Mother American Night: My Life in Crazy Times.